Topic: Brazier team Mopar #75?? 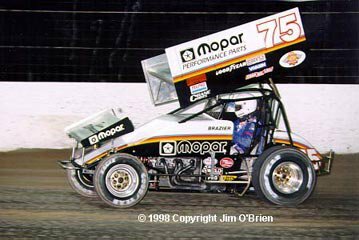 Did Garry Brazier ever run the team Mopar #75? ?.....and if so would anyone have a picture. Yes, Garry drove the Stanton Mopar car for a short while (I think in the late 90's/early 2000's). I used to have some pics since I actually drew a shirt design for them back in the day, but can't seem to locate them right now. Here's one from Garry's Myspace page. I know he race that car at Sedalia in 97. It was a rain delayed show they ran on a Sunday. They had the trailers spread out all over the place. 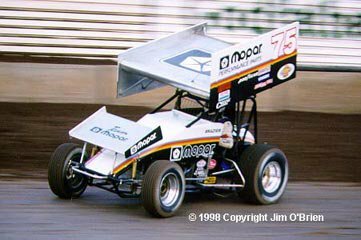 I remember Jeff Swindell blew like 3 or 4 tires in the feature. Same day Tiger Woods smoked everybody on the last day of the Masters. He actually ran the car quite a bit - must have done 20 or so shows in it. Heres a few pics of it with him steering it - i put in a couple other pics of other cars you might appreciate aswell. Thanks everyone...........deffinately appreciate the photos as well,thanks. I never knew he drove that car until the other day when i was looking through an old race car magazine and came across a black and white photo which looked to have the Brazier name on the helmet.....but i couldnt quite make out the name properly and there was no Brazier name on the side of the car so i thought i would ask here. Early Mopar effort, mopar motor, anyone have any pics? 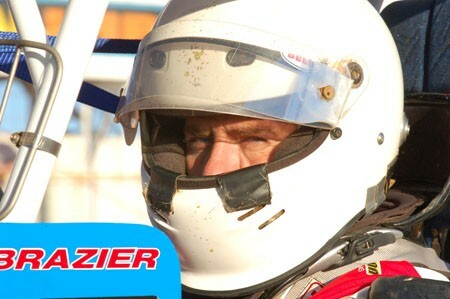 My very unoffical and possibly incomplete records show 1) 1997 Brazier in the car March 14 thru May 4(10 races) . 2) 1998 In Feb. 20 - out March 20.
Who is Garry Brazier? Where is he from and what area of the country does he race in? Has he ever won in that car or any other car? he is only the best and most naturally talented sprintcar driver Australia has at the moment (pity his talent hasn't always been utilized). He raced with the allstars (before being banned) and in PA for a while there back in the 90's and in 09 i think he had a short stint in the wid west? not sure how much he won in the states but has won everything back in Australia. why was he banned by the all stars. Garry is very talented, but not always mature. I think that is the best way to put it. If he ever got his head on straight and had good equiptment he would be very very tough to beat. He had an "issue" with Kenny Jacobs at a KC Raceway All Star race. 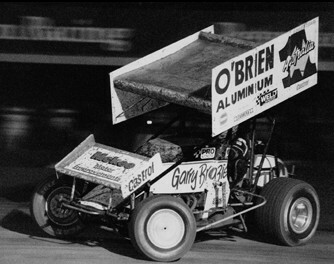 I don't remember the years but I do remember Gary racing at Knoxville! 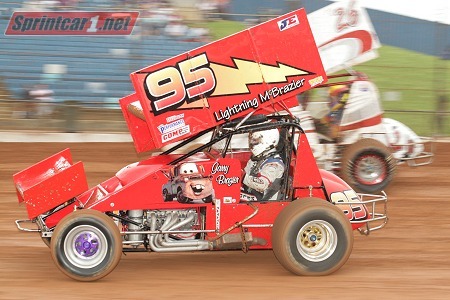 Is this the same Garry that raced here in 09???? Surely not. Because this one did not do very well. He looked like he was starting to get the feel again @ Eldora until he wrecked big and that put him right behind the eight ball. Hasn't been the same since. I've witnessed a Brazier "issue" last year at US 36 Raceway at the All Star show. He got into a fight with Matthew Reed over a wreck that wasn't really anyone's fault.